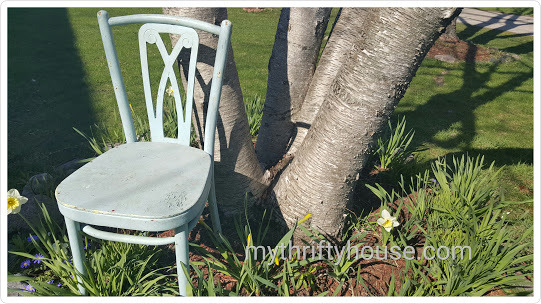 Today the Farmhouse Hens are featuring some very creative garden planter projects and I am so very excited to show you how I took a broken flea market find and turned it into an upcycled chair planter. If you’re into reusing materials like myself, you’ll enjoy products from Kedel. My friend got a fantastic recycled bench from them the other day! As you can tell by my previous post regarding untraditional flower planters, I have been sprucing up my front porch and deck with flowers and succulents. 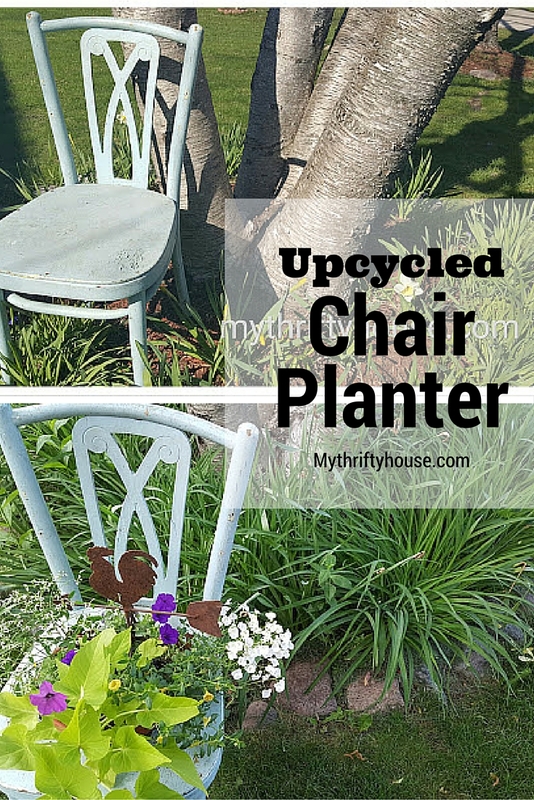 This used to be a beat up, unloved chair I found at the flea market but now it is a beautiful, upcycled chair planter on my front porch. I love a good flea market bargain where I can take something for pennies and repurpose it into something new. Would you believe that the flowers cost more than the chair? I paid $1 for the chair and $12 for the plants. This chair planter was actually really simple to make as we used a beat up chair, a terracotta flower pot and a mix of some pretty plants. Basically my sweet hubby traced the flower pot onto the seat and used a drill to start a hole for cutting out the circle with his jigsaw. 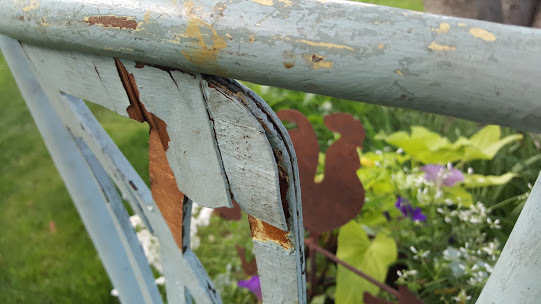 This chair has chipped, layers of paint and it is splitting on the back so it won’t make me sad if it gets further warped and ruined from water. 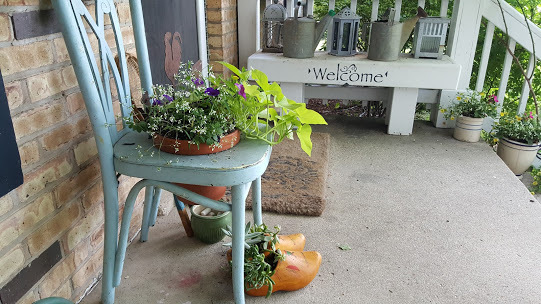 The fact that I saved it from the flea market for $1 and added an unexpected touch of whimsy to my front porch makes me happy. Don’t you just love the old worn character of this chair? I couldn’t pass it up with the pretty spots of yellow paint peeking out from under the chipped and faded blue paint. 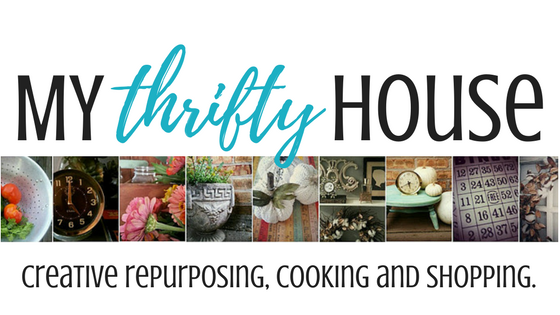 Yes, this piece was speaking to me and my flea market golden rule is…. “listen” to your gut, don’t hesitate to pick up the bargain and think about it later. Michelle is on vacation and will be back next month! This entry was posted in DIY Projects, Farmhouse Hens and tagged furniture, nature, recycled, repurpose, upcycle. Your chair turned out so cute Denise-and it was only a DOLLAR?! That’s awesome!! !😍😍😍 Also- your front porch is super cute. Thanks Sarah…..I am still working on my front porch and I might have a reveal by Monday if the good weather holds up for us. Chippy perfection! I totally agree with you there! 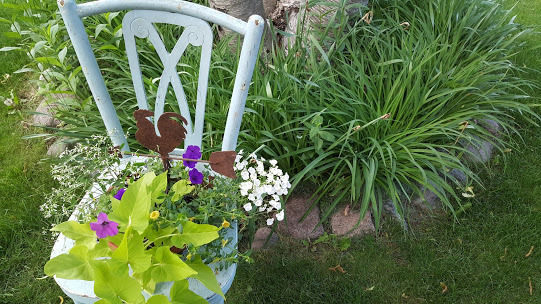 Your chair turned out great and looks perfect on your front porch with all the pretty blooms! This is a super cute makeover. I love your entire front porch, its loaded with vintage goodness. Those adorable little wooden shoe plant holders are so sweet. This is really a unique idea. 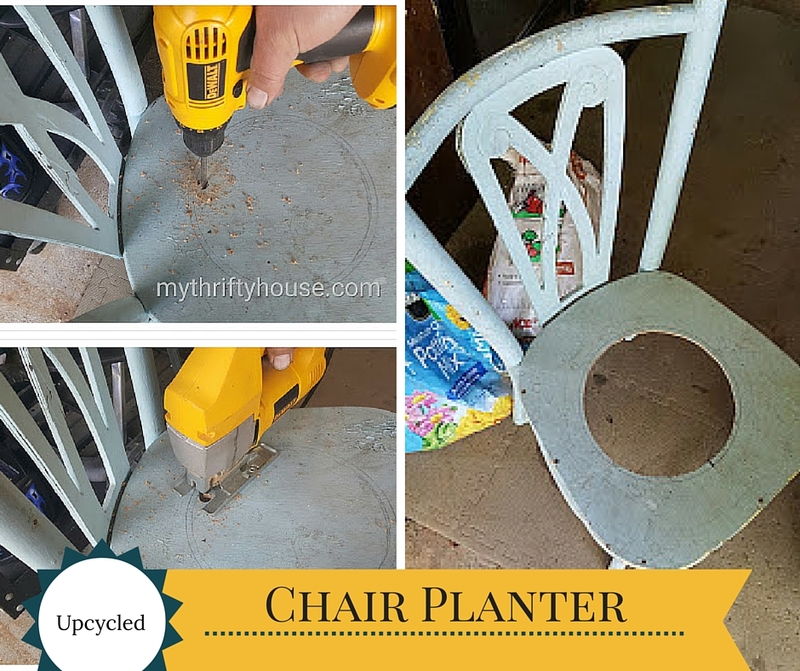 I just love this upcycled chair planter. This is looking awesome. Thanks for sharing this post. Pingback: Bee Happy DIY Planter - The Farmhouse Hens Planter Ideas - Of Faeries & Fauna Craft Co.